I just completed a Fan Dub of this rarely seen film. The US copy is in B&W and poor but mostly uncut. The Euro copy I used has about a dozen or so minutes cut from it. This copy, in widescreen and color, was really butchered but I did my best to make it seem seamless. There were three big scenes cut from it (including two whipping scenes and one dance / singing sequence which I uploaded at Youtube here) while 40 or so one second shots cut throughout this copy. A real nightmare to edit but the final Fan Dub still looks great. This is an interest film for many reasons : it was made in 1957, way before HERCULES, which spawned an endless number of such films. 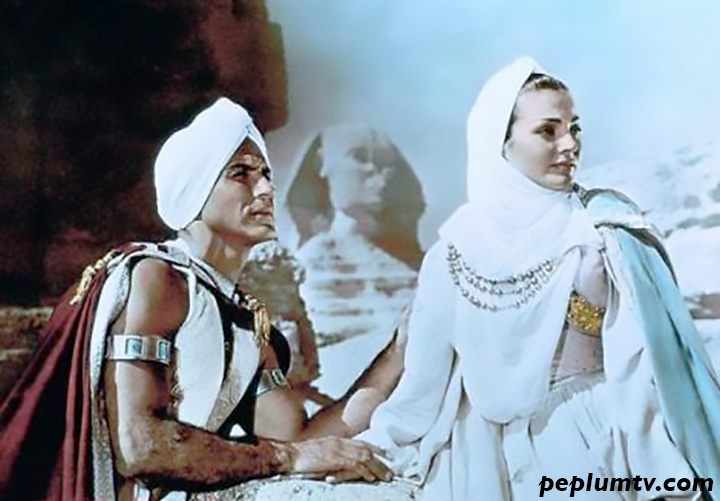 It's filmed on location in Egypt, and, to my knowledge, it's the first Arabian adventure shot in widescreen and color that was produced in Europe (THE ADVENTURES OF HAJJI BABA (1954) was the first US-made Arabian adventure shot in widescreen). I'm thinking of uploading this to my Youtube channel. I'm working on the final version for YT. Sounds great! Please do upload it.